The gardens and grounds of medieval castles are always something I enjoy walking amongst. Centuries of love, care and attention have, after all, been invested by many people in a single medieval garden; countless hours spent tending flower beds, herb patches and planting trees. Whatever the reason, if you have never visited a medieval castle garden .... you should! The gardens and grounds of Berkeley Castle are delightful. Nothing pretentious or ostentatious, just a big, beautiful green space broken up by dashes of colour from flowers here and there. 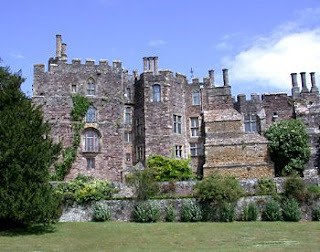 According to history, Queen Elizabeth I was a regular visitor to Berkeley Castle and enjoyed many hours walking the gardens and grounds. There certainly is a great sense of history as you walk on the grass, looking up at the massive stone walls of the castle.